Scottish shape-shifters' 1984 album. Now a five-disc boxset. Sparkle In The Rain was the first Simple Minds album written and recorded with Mel Gaynor, whose bludgeoning style ultimately propelled the band into the global elite. Greeted with some ambivalence from fans raised on earlier art-rock adventures, with hindsight its sullied reputation is more logically a consequence of what followed: the crass commercialism of Don't You (Forget About Me) et al. With today’s line-up – featuring Gaynor alongside founding members Charlie Burchill and Jim Kerr – thriving on the new-model bombast of 2014's Big Music, this impressive boxset offers a timely reappraisal. It's Gaynor who heralds the Simple Minds rock era with an ominously loud count-off to opener Up On The Catwalk. Yet beneath the thunder, the band's essential otherness endures in the ethereal exchanges between guitarist Burchill and keyboardist Mick MacNeil. Two years touring 1982’s New Gold Dream evidently heightened confidence – to the extent that covering Lou Reed's Street Hassle seemed a good idea. That such folly works is testimony to Kerr's motivational skills, while Waterfront and Speed Your Love To Me remain spectacular explosions of tone and texture. How Sparkle In The Rain took its creators to soem kind of summit. In early 1984, Simple Minds were massive. Or rather, Mel Gaynor's drumming on Waterfront, as recorded by producer Steve Lillywhite and engineer Howard Gray was the biggest noise in pop. The extended 12-inch of that single had the most incredible drum sound, primal and deluxe, impossible to ignore. It still packs a mighty wallop. Glaswegian changelings Simple Minds were five albums into their career, starting with a post-punk sound, then trying electrodance for a couple of albums, before finally breaking through with the aerated atmospherics of New Gold Dream (81,82,83,84), which drifted between the ears like a parade float. They found themselves part of a scene being lamely labelled "new rock" (U2, Echo & The Bunnymen, Big Country), suddenly hip, burgeoning and under intense, self imposed pressure to consolidate their late surge. This next record would be either huge or terminal. Embracing the inevitable, they hired new drummer Gaynor and renowned "new rock" architect Lillywhite to produce. The direction was clear: "We're gonna move on up to the waterfront" went the first lyric singer Jim Kerr found. "Up on the catwalk" went another. The new album was a vehicle designed for ascent. Encased in Associated Images's graphic, heraldic sleeve, Sparkle In The Rain (Virgin ***) was indeed the band’s first album to climb to Number 1. It's back, expanded to four CDs with outtakes, B-sides and live material, plus a DVD of attendant videos and a Steve Wilson 5.1 mix. It sounds shockingly current; plenty of acts are filling festival tents today with a similar noise. Simple Minds wrote by jamming. Waterfront grew out of bassist Derek Forbes's riff utilising just one note. The excellent new sleeve notes explain how Kerr was inspired by its driving, industrial pulse to draw on images of his grandfather's days in the Glasgow shipyards. Not much of that made the final lyric, though, which amounts to little more than variants on "I'm gonna move on up to the waterfront" and "Come in, come out of the rain ". This kind of gesture-heavy, emotion-flavoured writing feels great initially, but crumbles under scrutiny. The album, front-loaded with hits, starts to come loose in the second half too, with some weak tunes, a weird, military style cover of Lou Reed's Street Hassle and an unedifying instrumental closer. There's a sense the band have rammed themselves into a sonic ceiling, unable to ascend any further, with songs that can't quite withstand the scale of the enterprise. Nevertheless, in its day, the velocity of this sound propelled Simple Minds from cultish questers to world beaters, with the more focused follow-up, Once Upon A Time. But if you seek one recording that encapsulates the glorious, extravagant emptiness of the 1980s, look no further. 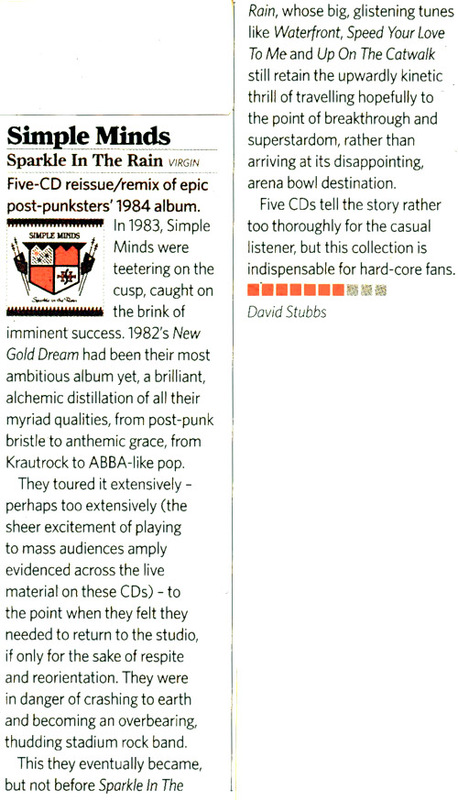 Five-CD reissue/remix of epic post-punksters' 1984 album. 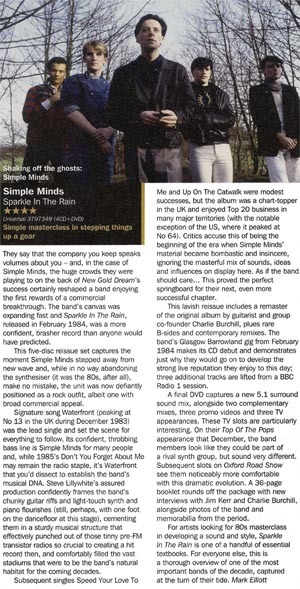 In 1983, Simple Minds were teetering on the cusp, caught on the brink of imminent success, 1982's New Gold Dream (81,82,83,84) had been their most ambitious album yet, a brilliant, alchemic distillation of all their myriad qualities, from post-punk bristle to anthemic grace, from Krautrock to ABBA-like pop. They toured it extensively - perhaps too extensively (the sheer excitement of playing to mass audiences amply evidenced across the live material on these CDs) – to the point when they felt they needed to return to the studio, if only for the sake of respite and reorientation. They were in danger of crashing to earth and becoming an overbearing, thudding stadium rock band. This they eventually became, but not before Sparkle In The Rain, whose big, glistening tunes like Waterfront, Speed Your Love To Me and Up On The Catwalk still retain the upwardly kinetic thrill of travelling hopefully to the point of breakthrough and superstardom, rather than arriving at its disappointing, arena bowl destination. Simple masterclass in stepping things up a gear. They say that the company you keep speaks volumes about you - and, in the case of Simple Minds, the huge crowds they were playing to on the back of New Gold Dream's success certainly reshaped a band enjoying the first rewards of a commercial breakthrough. The band's canvas was expanding fast and Sparkle In The Rain, released in February 1984, was a more confident, brasher record than anyone would have predicted. This five-disc reissue set captures the moment Simple Minds stepped away from new wave and, while in no way abandoning the synthesiser (it was the 80s, after all ), make no mistake, the unit was now defiantly positioned as a rock outfit, albeit one with broad commercial appeal. Signature song Waterfront (peaking at No 13 in the UK during December 1983) was the lead single and set the scene for everything to follow. Its confident, throbbing bass line is Simple Minds for many people and, while 1985's Don't You (Forget About Me) may remain the radio staple, it's Waterfront that you'd dissect to establish the band's musical DNA. Steve Lillywhite's assured production confidently frames the band's chunky guitar riffs and light-touch synth and piano flourishes (still, perhaps, with one foot on the dancefloor at this stage), cementing them in a sturdy musical structure that effectively punched out of those tinny pre-FM transistor radios so crucial to creating a hit record then, and comfortably filled the vast stadiums that were to be the band's natural habitat for the coming decades. Subsequent singles Speed Your Love To Me and Up On The Catwalk were modest successes, but the album was a chart-topper in the UK and enjoyed Top 20 business in many major territories (with the notable exception of the US, where it peaked at No 64). Critics accuse this of being the beginning of the era when Simple Minds' material became bombastic and insincere, ignoring the masterful mix of sounds, ideas and influences on display here. As if the band should care... This proved the perfect springboard for their next, even more successful chapter. This lavish reissue includes a remaster of the original album by guitarist and group co-founder Charlie Burchill, plus rare B-sides and contemporary remixes. The band's Glasgow Barrowland gig from February 1984 makes its CD debut and demonstrates just why they would go on to develop the strong live reputation they enjoy to this day; three additional tracks are lifted from a BBC Radio 1 session. A final DVD captures a new 5.1 surround sound mix, alongside two complementary mixes, three promo videos and three TV appearances. These TV slots are particularly interesting. On their Top Of The Pops appearance that December, the band members look like they could be part of a rival synth group, but sound very different. Subsequent slots on Oxford Road Show see them noticeably more comfortable with this dramatic evolution. A 36-page booklet rounds off the package with new interviews with Jim Kerr and Charlie Burchill, alongside photos of the band and memorabilia from the period. For artists looking for 80s masterclass in developing a sound and style, Sparkle In The Rain is one of a handful of essential textbooks. 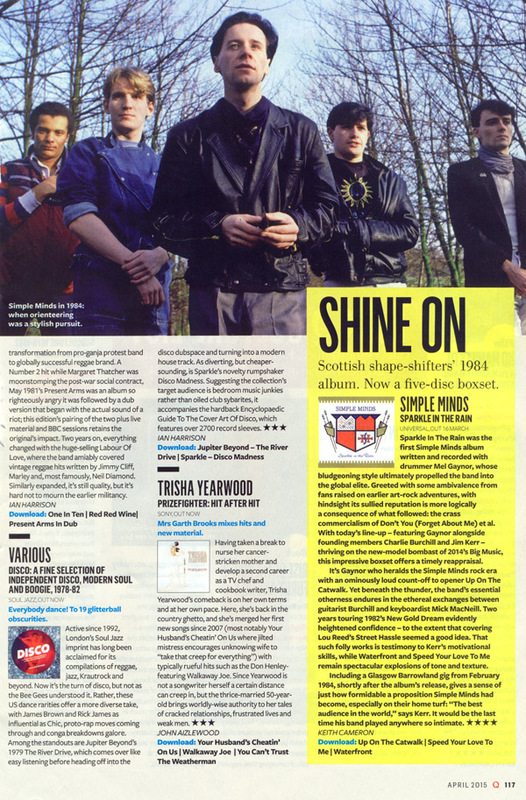 For everyone else, this is a thorough overview of one of the most important bands of the decade, captured at the turn of their tide. With U2 producer Steve Lillywhite at the helm, Sparkle was where the Minds flexed their rock muscle and defiantly mapped out the big music. Lyrically more direct than ever, channelling a sense of awe and revelation, the impassioned Kerr rides a newly liberated powerhouse sound foregrounding might Mel Gaynor's drums and Charlie Burchill's searing and calamitous guitar lines. The prescient Waterfront provided the anthemic focal point, but all around, a heightened drama was at work. Kerr, indefatigable on the giddy high jinx of Speed Your Love To Me (where the late Kirsty McColl provides vocal foil) welcomes vast peaks and invokes heady visions amid the shimmering atmospherics of White Hot Day. Time has been rather kinder to the Minds' vaulting ambition than more successful contemporaries – Sparkle's compositions' strong structure and valiant earthiness, particular evident on the ebullient live cuts, earths the grandiose leanings. Majoring in resourcefulness and imagination, Sparkle marks a key '80s transformation – from post-punk new pop into Teflon-coated rock powerhouse. Extras: Alternative edits, Radio 1 session, February '84 Barrowland live show, and DVD with 5.1 mix and promo videos.